On a prime spot on attractive historic streets filled with the independent shops and cafes is something that makes more than my eyes sore. It is not just happening in this city. People who have known Norwich a while will likely think of the shop on the corner of Bridewell Alley and Bedford street as Hovell’s. The basket makers come furniture department store ran for over a century, almost as well known as the Mustard Shop that used to be next door. It is a multi levelled building, larger than the exterior appears. Since Hovell’s moved out, it has been mostly empty – for over 4 years. A series of fashion boutiques at last filled the vacancy. But within a couple of weeks, the doors were heavily padlocked and a bailiff notice served from the landlord with breeze blocks around the entrance. Builders came in and there’s a for sale sign from Arnold Keys, but with such a landlord, who would want it? This makes me especially angry, for the unnamed landlord called in the Sheriff’s office of Croydon before trading had got off the ground. It’s a problem too common in times of hardship and debt, where owners try to exact power over others, using money and law as leverage. And it’s ugly. In walking distance is a former office block on Rose Lane, perhaps not Norwich’s prettiest building, but it did have some thought to local architectural trends. Now with metal grills over every opening, the building is uglier than it ever was in use. A man was at the reception desk late at night, and there were signs about 24 hour security and police dogs. Further up the street was a bunch of regular homeless people. As around the world, there are many people out of work, struggling in their own businesses, suffering from government cuts, and who live on the streets. All of those could benefit from those empty premises, which someone has found the money to defend and have watched, yet not offer low or even no rents to those who need them. The effect is uglier than the dereliction itself. I’d like to see the council wrest ownership and offer fair terms that don’t involve paid bullies. Both owners should be ashamed. 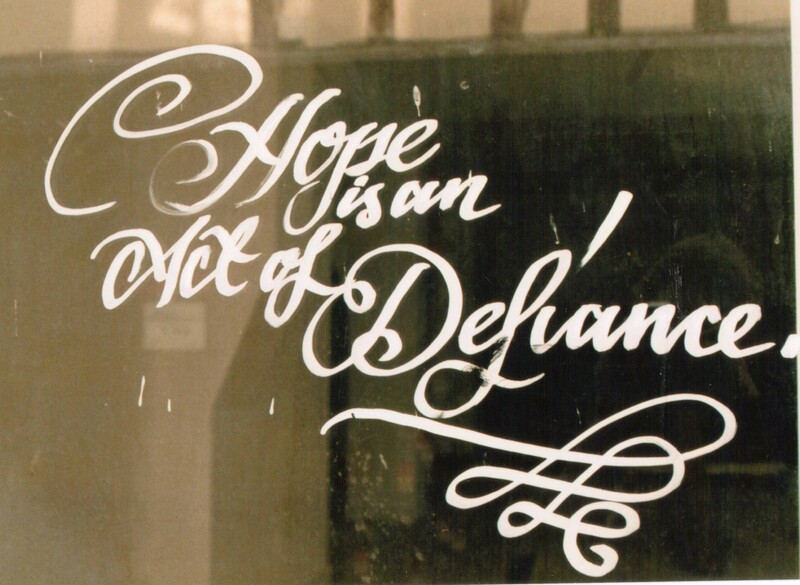 On the old Hovell’s building is some graffiti, in beautiful script, which says “Defiance is an act of hope”. (I preferred the reversed version – “Defiance is an act of hope”). These and similar messages (another was “Resistance is Fertile”). appear only on places that are being repainted, or on skips That message, more attractive than the empty building, indeed gives hope. I hope that the landlord and sheriffs read it and act accordingly. Ironically, this article was accepted 2 months ago for local Triangle magazine, who now declines as the editor ‘wasn’t comfortable’ with questions about pay and copyright. This is another issue I address elsewhere. It is unhelpful that the Bible has influenced our culture to believe that we are ahead of the animals and have, to quote that unfortunate Genesis phrase, dominion over them. Whereas ecological people of all beliefs have questioned how we can use this passage to subordinate the rest of the earth and how a good God would ask that of us (especially when doing so puts us all in danger), there are ways in which we carry out this traditional King James understanding, regardless of whether we take much heed of the Bible. Whereas experimentation, battery farming, and hurting animals is usually seen as disgusting, we are in a culture where animals can be killed at human whim. An unwanted litter? Too many pets at the rescue centre? Can’t afford to keep or pay the vet’s bills? I was alarmed to hear that if a horse breaks its legs, it’s shot. No braces or operations. We often hear so called animal lovers speaking about not being cruel by allowing something to continue to suffer. Yet only once have I heard someone claim that they felt the cat itself said it was time to release it. The decision is entirely the humans’. When I say the human, I don’t always mean its owner. I have often heard of someone taking their animal to the vets to come back with a corpse. We are obsessed with property, so that not only does every piece of land (as well as buildings) have to belong to someone, but so do the animals. If it’s domesticated, it comes under our jurisdiction with rules imposed on animals about tags, passports and behaviours – which can lead to their termination. The Green party – of which I am not a member – is all for mending what’s broken and not being so quick to discard. I’d like us to take that to animals too. The other fear is that how we treat animals is not far off how we see each other. Do we start ‘euthanizing’ people we can no longer afford to look after, state or privately? We also kill animals for disorders and traits that in humans we have fought so hard to have accepted and de-stigmatised. Do we bring back in the death penalty for not only murder but violence – absolutely not! The notion is that animals don’t have souls. Not long ago, it was believed that women didn’t either – it was still being debated within 100 years (as well as other ethnicities). We also assess which life forms are intelligent – probably ones we can get to do something for us – and which are crushable bugs and vermin. We have laws that say certain rodents must be reported and killed, whereas others can be our pets. Note that some keep as pets the very creatures that others fear. There are those who claim they can talk to animals. Critters apparently do not use language and communicate as we do, but they do feel. We are poor at communing with anything that doesn’t think and behave as we do. Some deride this notion, especially that an insect or similar can have feelings. We’re brought up to crush slugs, spiders, flies and wasps (though not hurt bees, even though they sting too). We are told to fear wolves and be glad that there are no longer wild in parts of the world. We are told that animals naturally have pecking orders and live in packs and can never be our friends unless we become its master. If a domesticated animal shows a sign of behaving in a way we are threatened by, it must die. If there is disease or even fear of disease, animals must be killed by law. I am incensed when I recall that marksman broke into a woman’s home to shot her sheep during a British supposed epidemic. Without trial of the animal, we put creatures we believe have no views or say to often immediate death. If we do not comply, then we are punished. I find it sickening that so many of our societies try to control so much of our lives – and now those of our fellow creatures, always against their interests. Societies that live close to nature often have better understanding and relationships with animals. 1 – why…. often violence is a product of violence, worse if it is human abuse that leads to a victims’ execution. 2 – to retrain them. I doubt that (m)any of animals killings are necessary. Why do we not let animals die naturally anymore? Money should never dictate the health or support of any being. I visited a former workhouse this weekend and I thought of what I wrote early in the new year on Dickens, and how timely he feels – and how frightening that is. Often resources are possible – we all know where the missing money is – in the pockets of the powerful few. It’s also not cheap to have animals killed and buried. Rather than scorning those who claim to speak with animals, listen to them; and start listening to creatures and respecting them. Is it not human fault that we breed more domestic animals than we can feed? In the wild, they would not have to rely on us to get their food, and sadly nature would take those that did not survive. And that does not mean we have the right to interfere with their bodies to keep the birthrate down. Rules about animals should be no more than needed; not lord over them or be controlling of humans who wish to have animals in their lives, whilst ensuring responsible stewardship. I don’t want more enforcement of having to go on training courses for pet owners, but perhaps training should be encouraged – and of the partnership, not mastery variety. I also call for a change in law to stop forcing the death of animals; and for a change of the expectation that people put animals down when there are often other solutions. And rather than dismissing them, that people who claim psychic powers with animals are listened to. It sounds like a gift that enhances animals’ and humans’ lives – and that these supposed lesser creatures have a lot to teach us. See also my Hubpage http://elspeth-r.hubpages.com/hub/Dont-cull-badgers-DO-chip-Dogs?! PS I now have a suggestion for ex bailiffs (as they should all be changing their jobs, as per my previous post on Justice in Banking) that they can be enforcement officers for animal cruelty rescue.